A few summers ago, I flew to Nashville to record vocals for a CD project. My friend, Kerri, and I had spent the last day of my trip in a studio, recording background vocals. When we were finished, I had to high tail it to the airport in order to catch my flight home. Kerri enthusiastically offered to take me to the airport. I was excited because I’m all about spending time with my girlfriends and catching up on life. As we made our way out to the car, Kerri apologetically mentioned that her young daughter had dropped a milk sippy in her car the day before, and that she hadn’t been able to locate it. Did I mention that it was one of those “you can fry an egg on the sidewalk,” dog days of August? Yep. It was! You know where this is going, don’t you? As we opened the car doors, Kerri and I were smacked silly with the stinky smell of sour milk. Not just a subtle smell, mind you – but a dominant, “been sitting in the 100 degree weather all day” smell. It reeked something fierce! We laughed until we almost cried at how horrible it smelled as we made our way down the expressway to the airport. Sounds kind of funny, but let’s be real: smells matter. Some smells, like a stinky sour milk sippy, are offensive. They make you want to run and hide. While other smells, like fresh baked bread, or a lotioned-up baby, are awesome and inviting. We need to remember that our attitudes and conversations give off a smell. The apostle Paul said, “But thanks be to God, who always leads us in triumphal procession in Christ and through us spreads everywhere the fragrance of the knowledge of him. For we are to God the aroma of Christ among those who are being saved and those who are perishing. To the one we are the smell of death; to the other, the fragrance of life” (2 Corinthians 2:14-16a, emphasis mine). Does your attitude give off an aroma of Christ? Are those around you drawn to Him as a result of the love and peace you display? Do your conversations consistently honor God, embody the fruit of the Spirit, and expel the fragrance of life…or are they sometimes laced with bitterness, resentment, anger, complaining, and gossip? Imagine what message it will send to our loved ones, our neighbors, our co-workers, and our communities when we intentionally locate and throw away our stinky, sour sippy attitudes, and seek God for renewal of our minds and actions. Let’s smell good today, friend! Let’s run the race before us as women of honor who, through the power of the Holy Spirit, give off an aroma of Christ. Spend some time in prayer right now. Ask God to reveal to you any areas in your life that might not “smell” as they should. Then talk to a trusted friend about what He brings to your heart, and ask her to pray for you and hold you accountable. 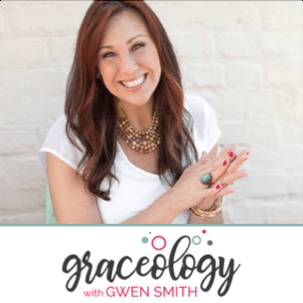 Have you listened to the new GRACEOLOGY with Gwen Smith podcast yet? Hang out with Gwen and friends when you go on walks, exercise, run errands or travel. Podcasts are also perfect to listen to as you do household chores! (Laundry anyone?) Each GRACEOLOGY with Gwen Smith podcast episode is filled with fun, faith-focused, grace-filled conversations that will help you know and trust God more. These discussions are going to encourage you in meaningful ways to live out and lean on the GRACE of Jesus in the midst of cluttered, messy days. CLICK HERE to listen on iTunes, or visit GwenSmith.net/Graceology for more information.